This post has nothing to do with sailing or preparing the boat for cruising. It has everything to do with turning the page and starting the next chapter. After 13 years of flying the world with Williams-Sonoma, I flew my last flight for them on Tuesday, September 4th. The flying bug bit me in grade school and, unable to shake it, I began flying right out of High School in 1969. Other distractions kept me from pursuing aviation professionally until 1986 and by 1989 it was finally my full time occupation. I do not know if there might be the occasional opportunity to find myself in the cockpit again – a little contract work here and there couldn’t be bad for the budget, but I am not planning for it. 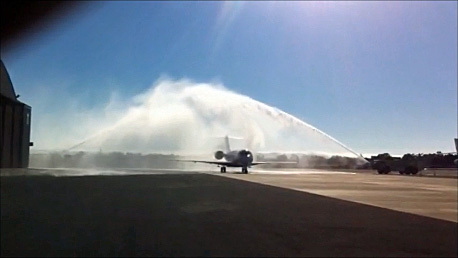 So, a lifelong passion and 23 years of professional flying taxied onto the ramp for the final time on Tuesday under the spray of the Oakland Airport Fire Department’s water cannons. Retirement will commence Saturday, the 15th, when Milagro will take Judy and I through the Golden Gate and turn left. The 15th!? Holy Cow, I better get busy…..
Congratulations on your retirement! Keep an eye out for Shindig next Saturday the 15th. We are leaving then too and will slowly make our way to SD for the Haha start. I need to get busy too! Thank you Robert, we will be looking for you. We plan an overnight at Half Moon Bay – maybe two, we’re not in any hurry, then the same at Capitola. Love the water cannon shot! Congrats!! !